OMG - what a day! We got up at 3:45 a.m., had our storage bags ready and waiting by the room door, and headed down to breakfast after checking out and putting the bags in the storage room. From there, a warm breakfast with some tea, and we were on our way to the train station. Originally, in order to catch the early train, one would only need to go a few minutes out of town, but the floods of 2010 covered over the tracks for a significant part of the pass, so we headed out to the next town over to catch the 6:59 am train. 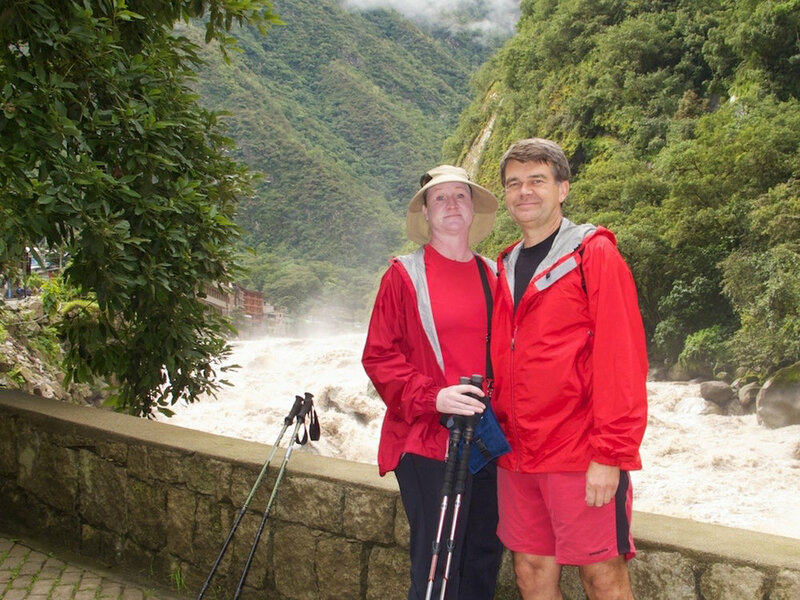 Our travel guide gave us the tickets to get to Machu Picchu (hereafter referred to as MP), round trip tickets for the bus to the sanctuary, and sanctuary entry passes. Notice that it wasn’t a round trip ticket for the dome train...needless to say, not thrilled about that! 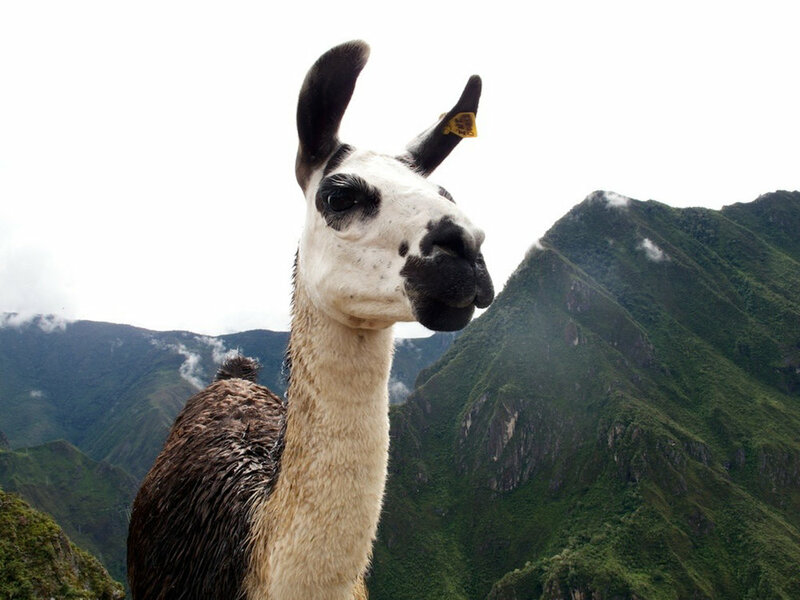 The guide was giving our return tickets to the group leader, who had yet to arrive in Cusco. In fact, the rest of the group wasn’t scheduled to arrive until 6pm today! And I, the youngest in the group, was entrusted the tickets we had...so why couldn’t we have our return passes? It amazes me still. Argh. The ride up on the dome train was wonderful - although Randall kept muttering about wifi, and needing it at the hotel in MP. =] The scenery was spectacular, words cannot do it justice. When we arrived in Cusco, we were greeted by our Condor guide, Fredy, who was guiding us on our hike up to MP. Mind you, only Wayne & I did the hike, the others took the bus. The weather was perfect climbing up, slightly overcast, and dry. About 5 minutes after I got to the sanctuary, it started raining. Fredy, Jaques, Wayne and I entered the sanctuary, and toured around. My feet were absolutely aching, but I have to say the toe sneakers were great. I didn’t lose a single toenail, and I didn’t fall at all. We climbed around the park in the rain for at least two hours, seeing the temples, altars, housing areas, farming terraces, and other general areas. The construction was amazing - built to withstand years of earthquakes and flooding. 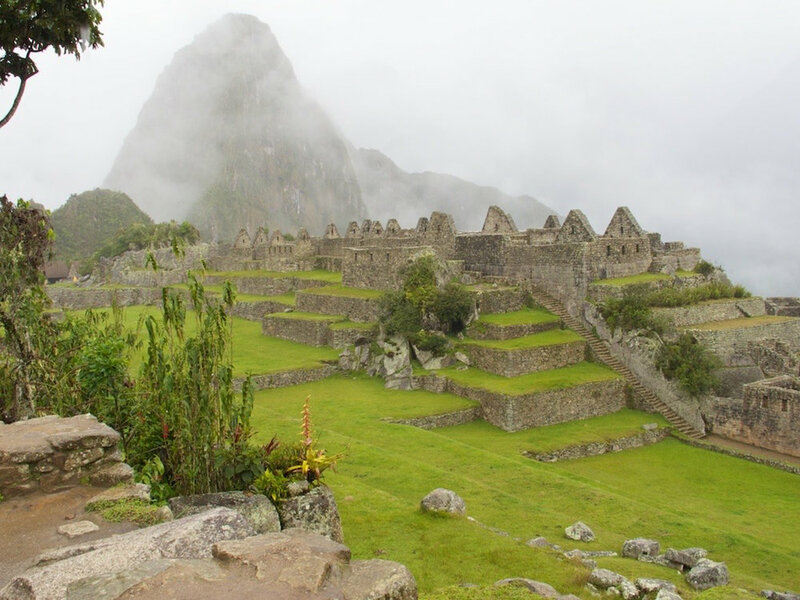 The stones were all mined from the mountain itself, and the Incas channeled the natural mountain waters into irrigation paths throughout the city. Fantastic, long lasting architecture. As Randall pointed out, sometimes we forget all the advanced learning that was accomplished centuries earlier. Of the park, Bingham said, “It has the majestic grandeur of the Canadian Rockies, as well as the startling beauty of the Nuuanu Pali near Honolulu, and the enchanting vistas of the Koolau Ditch Trail on Maui...” Couldn’t have said it better myself. After lunch, we went back into the sanctuary (it had stopped raining) and got a lot of pix. Then down to the downer of the day - our hotel. They put us in a room with two twin beds, despite the fact that we had paid for a “superior” room with one larger bed. When I asked at the front desk, and mentioned that it was coinciding with our anniversary, they did absolutely nothing to help. Boy, was I furious. In fact, I will be letting the arranger of our trip know of my dissatisfaction when I get home. After that, I went to buy entry to the park so that we can go up tomorrow at sunrise to celebrate our anniversary. Dinner was tasty, at a French/Peruvian bistro in town, but the staff became completely overwhelmed by three large groups, and we were forgotten. Not happy about that one, I’ll tell you. And we were seated behind the entry door, which patrons kept slamming into our table, and leaving open thus letting in all the cold air. I’ll likely not go there ever again, and will stick to Toto’s House or a pizzeria, of which there were plenty!